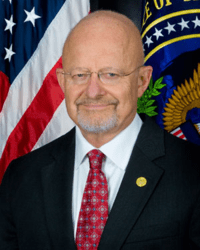 The National Security Archive (not to be confused with the Agency) announced this week that James Clapper, the Director of National Intelligence, has won its annual "Rosemary Award." The award is named after Rose Mary Woods, President Nixon's personal secretary, who claimed to have accidentally created the famous 18-and-a-half-minute gap on one of the Watergate tapes. It is awarded to the official exhibiting the "worst open-government performance" during the previous year. Clapper, shown here in his official government smirkograph, took top honors for lying to the Senate Intelligence Committee when asked whether the NSA (the other one) collected "any type of data at all on millions or hundreds of millions of Americans?" He later admitted that his answer, "no," was false but argued that it was the "least untruthful" answer he could give to what he thought was an unfair question. But later still he claimed that he misunderstood the question and thought it was about a different program. So I guess the argument is that at the time he was truthfully answering the wrong question but later falsely claimed to have lied about the right one. He beat out some very strong contenders, notably NSA Director Gen. Keith Alexander, who repeatedly claimed (for example) that the bulk-data-collection program the agency officially didn't have had prevented 54 terrorist attacks against the U.S. (he was off by 54), and lawyers in the Justice Department's National Security Division. The latter were nominated for stating under oath that in their view the entire text of an important court opinion had been appropriately classified "Top Secret/Sensitive Compartmented Information," although as the award points out, that text included, among other things, a block quote providing the text of the Fourth Amendment. There was probably a time when classifying the text of the Fourth Amendment as "Top Secret" and then falsely denying that under oath would have been good enough to win this award, but my friends, those days are gone. Okay, congratulating JC on his award may be more difficult than I thought. Apparently you can't email the Office of the Director of National Intelligence directly—under "Contact Us" its website gives only the mailing address and phone number, which seems a little retro. If you call, I assume they'll just trace that straight back to you, so maybe the thing to do is send him a nice card that you've worn gloves while handling. The thoughtful and prudent way to congratulate a government official. 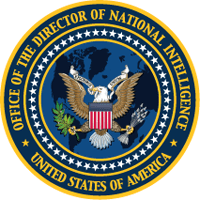 By the way, according to the website "[u]sage of the ODNI seal, as well as the name and initials, is governed by ODNI Instruction Number 2005-08," which apparently says that these are to be used only by "individuals within the ODNI for official business" and that "[n]o person shall use the official name, initials, or seal in connection with any commercial activity" without written authorization. Oddly, just below this scary instruction not to use the ODNI seal is the phrase "Download the ODNI Seal" and two graphics-file extensions. But although that certainly suggests you should click on that text, it isn't actually linked to anything. And yet the page bears an image of the seal on which one can easily right-click and download that way. It's all either super-devious or possibly just stupid. I keep forgetting how thin the line is between them.